If you’ve forgotten your Windows password and you don’t have an install CD laying around, there’s no need to worry. Not only are there half a dozen complicated ways to reset the password, you can do it easily with the Offline Windows Password editor. Of course, if you do have a Windows CD, you can reset your password the easy way with a simple trick. Then download and launch ImgBurn, which is a really simple piece of software that helps you burn an ISO image to a disk. Note: if you have some other application for burning an ISO image, you can use that instead. Choose the Source, click the burn button, and create the boot disk. 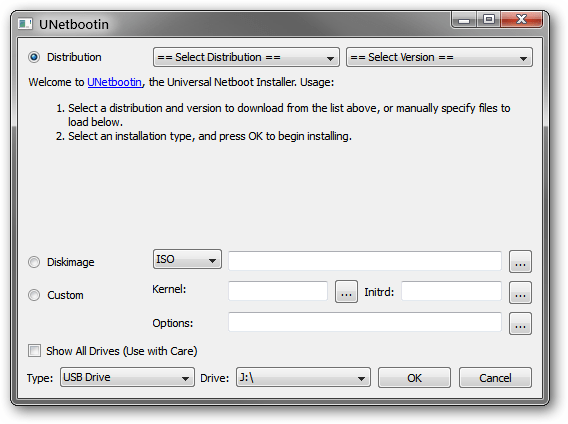 You could also create a bootable USB drive instead if you’d like, the instructions are on the Offline NT download site. Boot your PC from the boot disk (you might have to adjust the BIOS to allow booting from the CD). You’ll be prompted at a couple of screens, which you can generally just hit the Enter key at. For instance, this screen asks if you want to select the first partition, and  is already selected, so just hit Enter. The same thing happens at the next step, where you have to choose the path to your registry. The default is fine, so hit Enter. Next you can choose whether to use password reset or some other thing, so just hit Enter for password reset. Next you’ll be prompted whether you want to edit users or the registry. You want to edit user passwords, so hit Enter again. And now, the first screen where you’ll need to do something other than hit the Enter key. In this case, you’ll want to type the username that you want to reset. In my case, this was “geek”, so I just typed that (without the quotes). Then hit Enter. Now you’ll want to probably just blank the password, which is already selected, so hit the Enter key again (you can always change it once you’re back in Windows). And now, you’ll have to save what you just did. So type an exclamation point to quit (or the “!” symbol), then type the letter “y” to save. At this point it should say “EDIT COMPLETE”, and you can reboot your computer. You should be able to login without any problems—just make sure to go set a new password. Boot off the Windows disk and select the “Repair your computer” option from the lower left-hand corner. Follow through until you get to the option to open the Command Prompt, which you’ll want to select. Now you can reboot the PC. Once you get to the login screen, hit the Shift key 5 times, and you’ll see an administrator mode command prompt. That’s all there is to it. Now you can login. 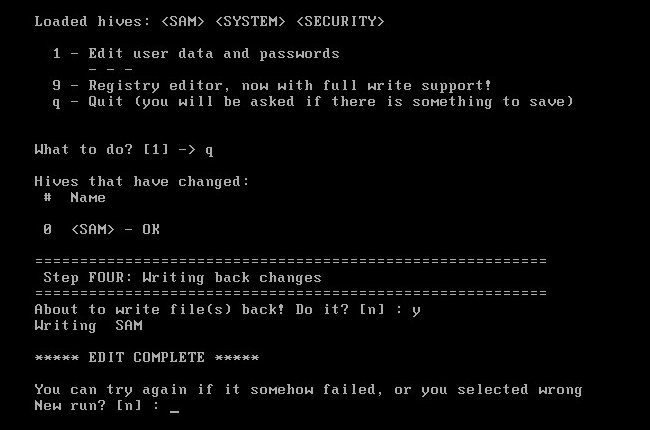 Of course, you’ll probably want to put the original sethc.exe file back, which you can do by rebooting into the installation CD, opening the command prompt, and copying the c:\sethc.exe file back to c:\windows\system32\sethc.exe. Product keys are one of the most important parts of your computer. Unfortunately, most people don’t have them backed up. Here is how you can recover your product keys in case your computer crashes. The methods described below will also work to backup your product keys before your computer crashes. If you are the cautious type, and you should be, use the tools described below to backup your software product keys before it’s to late. 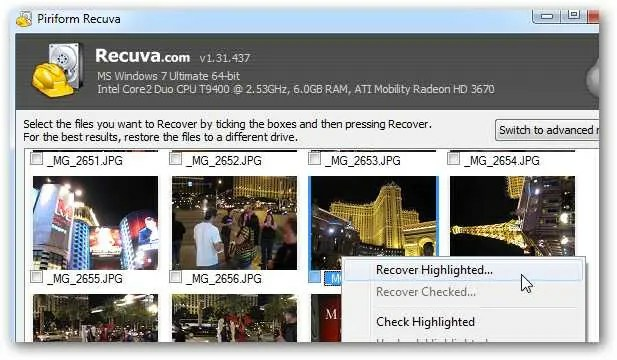 The first think you need to do is recover some files from your broken computer’s hard drive. 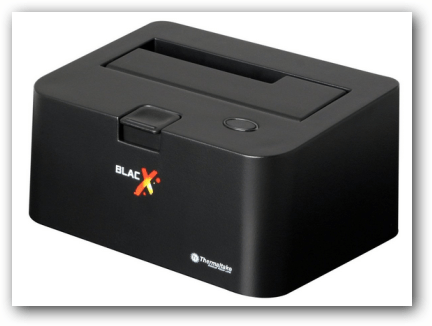 To do that you can either pull out the hard drive and plug it into a second computer using a spare hard drive connector or use a SATA USB docking station like the one below. If you don’t have any SATA openings and don’t have a SATA docking station you can recover the files with a live Linux USB drive too. Use whatever distribution you feel comfortable with because you just need to copy a folder to the drive. If you are using Linux, boot the broken machine from the drive, and copy this folder to the USB drive. 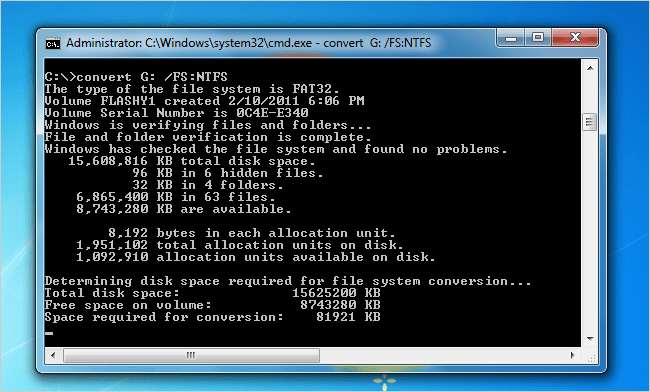 Our config folder was only 140 MB in size which will easily fit on most USB drives. Yours may be slightly bigger but you will need to take into account the ~700 MB of space needed for the Linux files. Once you have the folder, go to another computer running Windows to use the free utility to recover your keys. ProduKey is made by our friends at Nirsoft and will allow you to recover your product keys from a running version of Windows just the same as a copied C:\Windows\System32\config folder. Start by downloading ProduKey from the link below and extract the exe file to a place of your choosing. Launch the program and it will immediately recover the available product keys from your current Windows installation. Now may be a good time to save your current product keys somewhere safe. 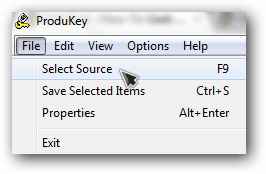 To recover the keys from the broken copy of Windows, drop down the file menu and choose select source. From the new window select “load the product keys from external Windows directory” and then browse to your saved Windows folder. If you used a live Linux disk to recover the config folder you will need to manually make Windows and System32 folders and then place your config folder inside of them for the keys to be read. If you are using a USB docking station, you can also just select “load the product keys of external Windows installations from all disks currently plugged to your computer” and the drive will be scanned automatically. ProduKey will now show you all the keys it was able to find from your broken computer which makes it very handy when needing to re-install. To make sure your keys stay safe click the save icon and save a text file of your product keys. We would recommend emailing yourself the text file or saving it to an off site location for safe keeping. So, how do you find out what the problem is? 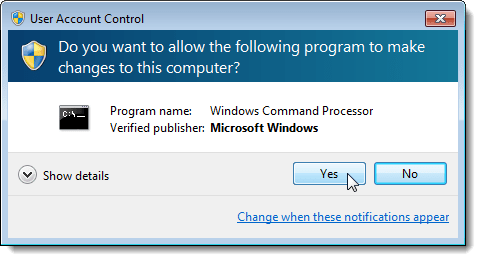 There is an easy method using the netstat command from a command prompt window. This works with Windows 7, Vista, and XP. If you’re still using XP, make sure you are running at least Service Pack 2. 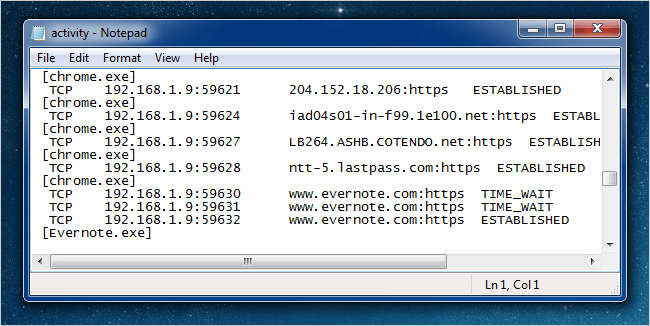 We will use the netstat command to generate a list of everything that has made an internet connection in a specified amount of time. To use the netstat command, you must run the command prompt window as administrator. Open the Start menu and enter “cmd.exe” in the Search box. When the results display, right-click on cmd.exe and select Run as administrator from the popup menu. 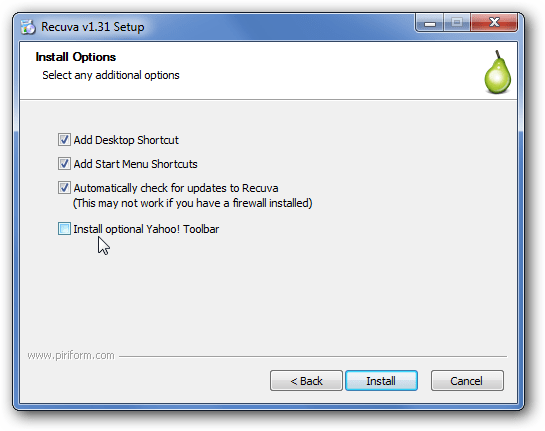 If the User Account Control dialog box displays, click Yes to continue. Note: You may not see this dialog box, depending on your User Account Control settings. 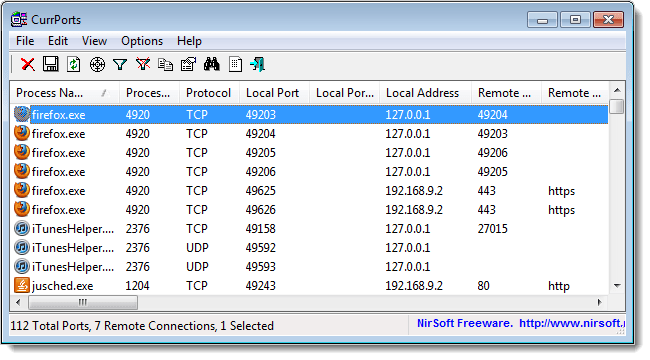 The –a option shows all connections and listening ports, the –b option shows you what application is making the connection, and the –f option displays the full DNS name for each connection option for easier understanding of where the connections are being made to. You can also use the –n option if you wish to only display the IP address. The 5 option will poll every 5 seconds for connections to make it more easy to track what is going on, and the results are then piped into the activity.txt file. Once you’ve finished recording data, you can simply open the activity.txt file in your favorite editor to see the results, or you can type activity.txt at the command line to open it in Notepad. If you see process names or website addresses with which you are not familiar, you can search for “what is (name of unknown process)” in Google and see what it is. It may be a system function you don’t know about or a function of one of your running programs. However, if it seems like a bad site, you can use Google again to find out how to get rid of it. You can also use a free tool, called CurrPorts, to display a list of all currently opened TCP/IP and UDP ports on your local computer. It is a portable program and doesn’t need to be installed. To use it, extract the .zip file you downloaded (see the link at the end of this article) and run cports.exe. For each port that CurrPorts lists, information about the process that opened the port is displayed. You can select connections and close them, copy a port’s information to the clipboard or save it to an HTML file, an XML file, or a tab-delimited text file. 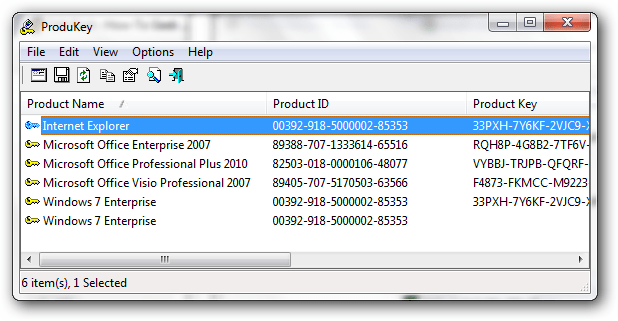 You can reorder the columns displayed on the CurrPorts main window and in the files you save. To sort the list by a specific column, simply click on the header of that column. CurrPorts runs under Windows NT, Windows 2000, Windows XP, Windows Server 2003, Windows Server 2008, Windows Vista, and Windows 7. There is a separate download of CurrPorts for 64-bit versions of Windows. You can find more information about CurrPorts and how to use it on the website listed below. 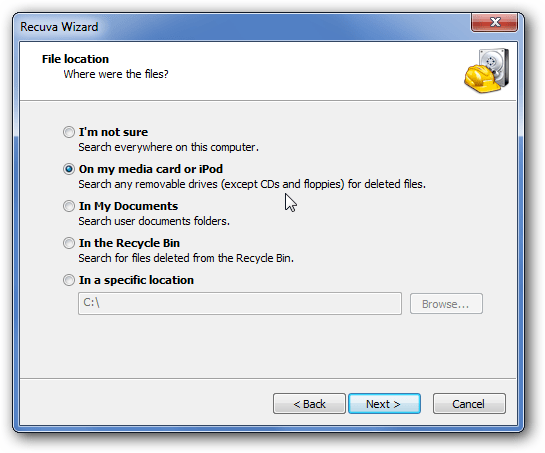 Windows tries to prevent you from making a big mistake by providing the Recycle Bin, where deleted files hang around for a while—but unfortunately it doesn’t work for external USB drives, USB flash drives, memory sticks, or mapped drives. 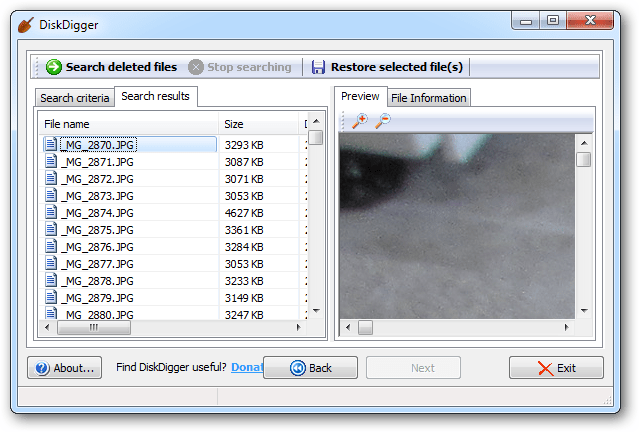 Luckily there’s another way to recover deleted files. Note: we originally wrote this article a year ago, but we’ve received this question so many times from readers, friends, and families that we’ve polished it up and are republishing it for everybody. So far, everybody has reported success! 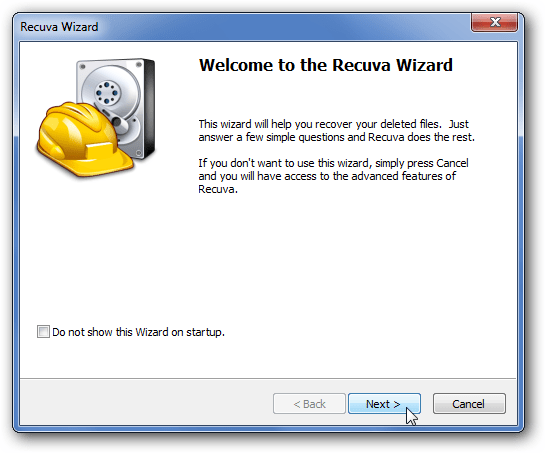 The first piece of software that you’ll want to try is called Recuva, and it’s extremely easy to use—just make sure when you are installing it, that you don’t accidentally install that stupid Yahoo! toolbar that nobody wants. 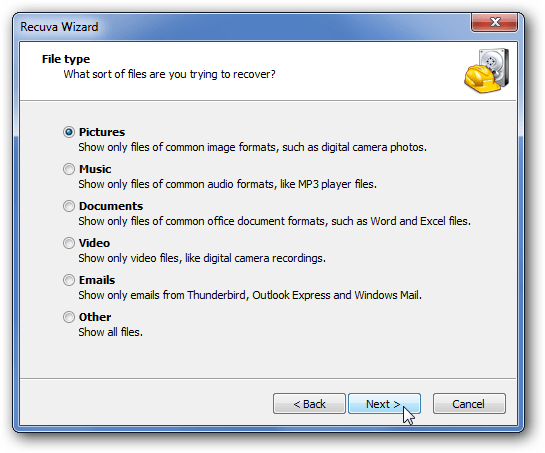 The first step on the wizard page will let you tell Recuva to only search for a specific type of file, which can save a lot of time while searching, and make it easier to find what you are looking for. Next you’ll need to specify where the file was, which will obviously be up to wherever you deleted it from. Since I deleted mine from my camera’s SD card, that’s where I’m looking for it. The next page will ask you whether you want to do a Deep Scan. My recommendation is to not select this for the first scan, because usually the quick scan can find it. You can always go back and run a deep scan a second time. If there are a really large number of results, and you know exactly when the file was created or modified, you can switch to the advanced view, where you can sort by the last modified time. This can help speed up the process quite a bit, so you don’t have to look through quite as many files. At this point, you can right-click on any filename, and choose to Recover it, and then save the files elsewhere on your drive. Awesome! Update: it looks like since we first wrote about this, DiskDigger became shareware, which gives you a prompt for every file you save. It’s up to you whether you want to try it—best bet, try Recuva first. You could alternatively use the slightly older, but still totally free, portable version of the application from portablefreeware.com. Thanks, Mary! 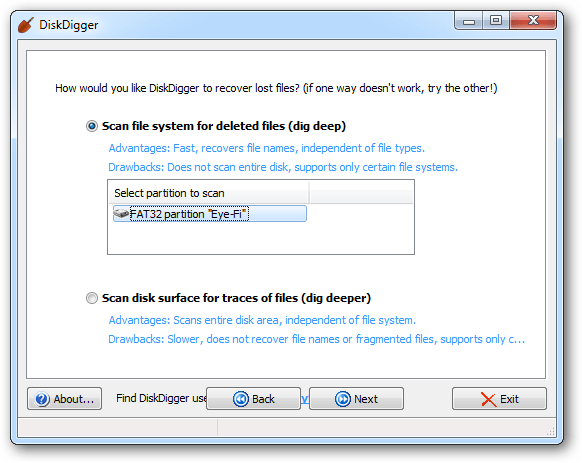 If you don’t have any luck with Recuva, you can always try out DiskDigger, another excellent piece of software. I’ve tested both of these applications very thoroughly, and found that neither of them will always find the same files, so it’s best to have both of them in your toolkit. 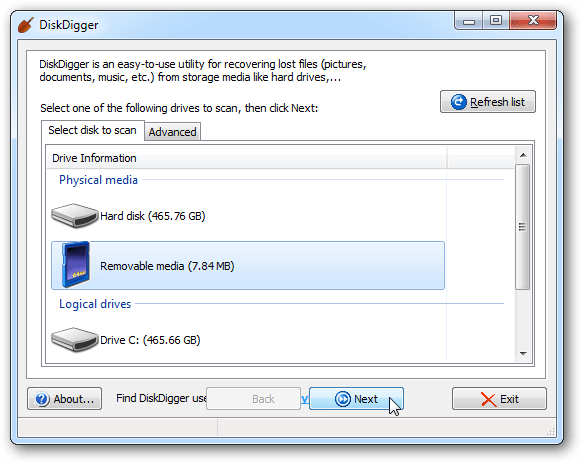 Note that DiskDigger doesn’t require installation, making it a really great tool to throw on your PC repair Flash drive. Now you can choose whether to do a deep scan, or a really deep scan. 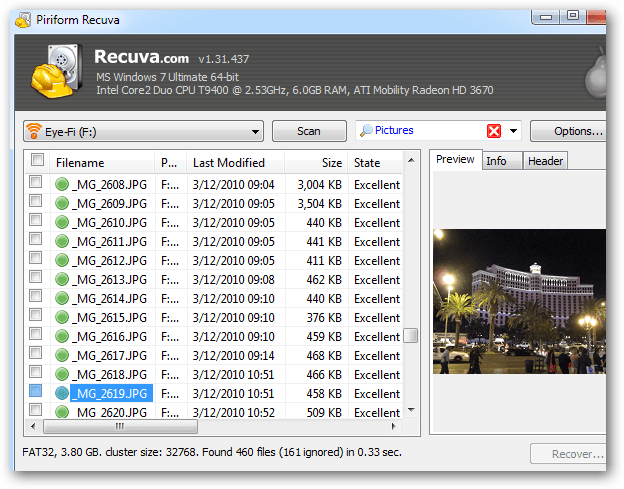 Just like with Recuva, you’ll probably want to select the first one first. I’ve also had much better luck with the regular scan, rather than the “dig deeper” one. 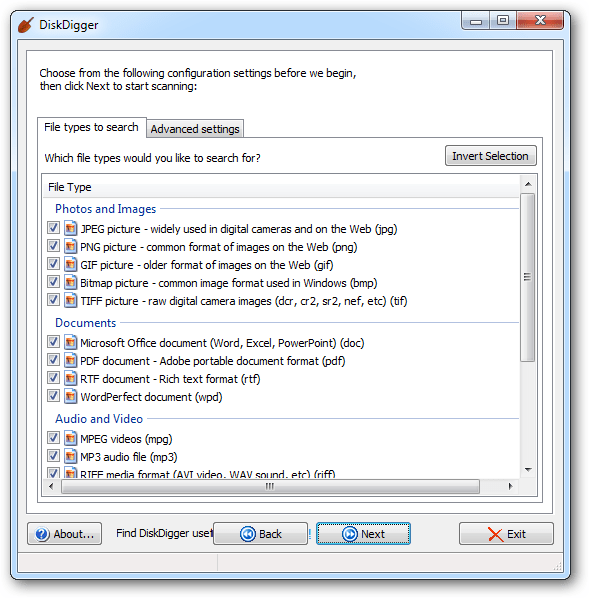 If you do choose the “dig deeper” one, you’ll be able to select exactly which types of files you are looking for, though again, you should use the regular scan first. Once you’ve come up with the results, you can click on the items on the left-hand side, and see a preview on the right. You can select one or more files, and choose to restore them. It’s pretty simple! Good luck recovering your deleted files! Takeaway: After a long stretch of stagnation, the developer field is starting to open up — in a number of interesting, groundbreaking ways. Ever since I was a kid, being a programmer looked fun and exciting. But in the last decade, the novelty of the Internet has worn off, and it seems like we’ve just been spinning our wheels. With an increasingly uninteresting workload and stagnation in pay, a lot of folks have either left for other pastures or have thought about it. Well, in the last year or two, things have really changed. Here are 10 reasons why now is a great time to be a developer. HTML5 has completely turned the world of development on its head. For years, we were locked into a limited set of applications, not because we couldn’t make magic happen, but because there were so many issues with getting our solutions to market. When the Web arrived, it unlocked a lot of new avenues, but its limitations were such that the really exciting things were still saddled with the native desktop application model. HTML5 takes off many of those shackles, and we are about to experience a boom time for new ideas. When I first encountered Agile methods, it was from the vantage point of seeing some really shoddy practices being called “Agile” out of laziness. And while I think there is still a use for more Waterfall-like techniques, Agile should be the default choice for teams going forward. With Agile, we’re given a lot more freedom to do what we love — deliver innovative, customer-satisfying solutions — whereas in the past, we were stuck guessing what users wanted and usually ended up developing what their managers or our managers assumed they wanted. Why do I love the software-as-a-service (SaaS) model as a developer? Because for the first time ever, developers can monetize their products in a fashion that is fair to both sides of the transaction. Sure, developers always could just charge for development, which was fair enough. But if you are trying to make “shrink wrap apps,” the previous models are all awful. They usually lead to customers being force-fed upgrades or support they don’t want in order to keep a vendor in business or to having vendors charge too much so they can provide “free” support and upgrades. Thanks to SaaS, the shrink wrap model is profitable in a fashion that benefits everyone. Seriously, could it get any cheaper to start your own company now? I read press releases of companies getting off the ground with only a million dollars, where in the past it would be $10 million or more to get going. What’s changed? Various platform-as-a-service (PaaS) and infrastructure-as-a-service (IaaS) vendors let you go from “project done on my weekends” to “deployed and ready for business” in literally minutes. You can have a flexible billing schedule that allows you to cover the costs out of pocket easily and have your costs scale with your money flow. Meanwhile, platforms like Ruby on Rails have emerged to make it easy to get off the ground without all of the monetary and technical overhead associated with developing in more traditional systems. Thanks to the explosion in the mobile markets, there are hundreds of millions of potential software customers who never existed before. Their bank accounts are directly tied to the software discovery system, and they are accustomed to paying (albeit, not very much) for software. And the mobile revolution has enabled all sorts of amazing new apps and games that really just could not exist before. Best of all, mobile applications and devices serve users in way that offers far more satisfaction than traditional desktop computing. Talk about a seller’s market. Are there soft spots in the job market? Absolutely. I’d hate to be an entry-level programmer with no real-world job experience and no special skills competing against the overseas talent who can deliver more skills for less money. And yes, some intermediate developers are getting a squeeze as well. But you know what? The demand for talent overall is at a level that is nowhere near being met, and it will only get harder to find the right folks. And the pay scales are reflecting the lack of supply. While it can be tough to get your footing, once you have established a record of good work and a valuable, up-to-date skill set, it is pretty easy to stay employed at a fantastic pay rate. Until someone comes up with a reliable way of having applications write themselves, the job market will only improve for developers so long as they are willing to put in some effort with skills improvement. The graduation rates for development-related majors are not ramping up to even come close to meeting the demand. If you have a foothold in the industry today, and do not let your skills deteriorate or go out of date, the job market should treat you very well over the course of your career, and certainly much better than most jobs. Those mobile devices have done something amazing: They’ve allowed entire segments of the world’s population to have access to computing when before there was none. Not only does this create potential new users and customers, but it allows our work to have a positive influence on the world like never before. Some of the mobile applications I have seen do truly amazing things, like allowing farmers in Africa to determine whether there is a demand for crops before starting a long trek to market, or enabling doctors in poor parts of Asia to communicate with each other to share lifesaving information. Being able to be part of something more impactful than merely making a living is a great feeling! When the idea of a “personal computer” came about, most folks treated it as “my personalcomputer” in contrast to “the company’s computer” or “the shared mainframe.” Now, “personal computer” is becoming much more similar to what visionaries like Dr. Alan Kay imagined in the 60s, 70s, and 80s, a system that individuals can customize on the fly to meet their needs easily. Is this a reality yet? No. But for the first time in a long time, it looks like the industry is actually starting to move in that direction, and it can’t come soon enough. I look forward to being part of the revolution that allows people to leverage their computing devices to accomplish their goals, instead of the devices depending upon users to do what they need to do for the applications to meet their own goals. As things continue to shift and change in the IT industry, our networking and systems administration brethren are seeing their jobs become more routine and less exciting. Meanwhile, programmers are the fulcrum that the IT lever pivots on. Without us, companies are forced to accept solutions out-of-the-box and attempt to make their business processes match the solutions. Entire industries are experiencing unprecedented paradigm shifts, thanks to the recent innovations in software. Up until a few years ago, it was hard to make software that did more than replace filing cabinets and calculators. Now we’re making software do things that have never been done before, and the world depends on us to make it happen. Do the reasons cited here make the developer field seem more enticing and full of opportunity than in previous years? What other aspects of current tech trends make this a good time to pursue a career in development? Duplicate Content has become a huge topic of discussion lately, thanks to the new filters that search engines have implemented. This article will help you understand why you might be caught in the filter, and ways to avoid it. We’ll also show you how you can determine if your pages have duplicate content, and what to do to fix it. First, we must understand that the term “duplicate content penalty” is actually a misnomer. When we refer to penalties in search engine rankings, we are actually talking about points that are deducted from a page in order to come to an overall relevancy score. But in reality, duplicate content pages are not penalized. Rather they are simply filtered, the way you would use a sieve to remove unwanted particles. Sometimes, “good particles” are accidentally filtered out. Websites with Identical Pages – These pages are considered duplicate, as well as websites that are identical to another website on the Internet are also considered to be spam. Affiliate sites with the same look and feel which contain identical content, for example, are especially vulnerable to a duplicate content filter. Another example would be a website with doorway pages. Many times, these doorways are skewed versions of landing pages. However, these landing pages are identical to other landing pages. Generally, doorway pages are intended to be used to spam the search engines in order to manipulate search engine results. Scraped Content – Scraped content is taking content from a web site and repackaging it to make it look different, but in essence it is nothing more than a duplicate page. With the popularity of blogs on the internet and the syndication of those blogs, scraping is becoming more of a problem for search engines. E-Commerce Product Descriptions – Many eCommerce sites out there use the manufacturer’s descriptions for the products, which hundreds or thousands of other eCommerce stores in the same competitive markets are using too. This duplicate content, while harder to spot, is still considered spam. Distribution of Articles – If you publish an article, and it gets copied and put all over the Internet, this is good, right? Not necessarily for all the sites that feature the same article. This type of duplicate content can be tricky, because even though Yahoo and MSN determine the source of the original article and deems it most relevant in search results, other search engines like Google may not, according to some experts. So, how does a search engine’s duplicate content filter work? Essentially, when a search engine robot crawls a website, it reads the pages, and stores the information in its database. Then, it compares its findings to other information it has in its database. Depending upon a few factors, such as the overall relevancy score of a website, it then determines which are duplicate content, and then filters out the pages or the websites that qualify as spam. Unfortunately, if your pages are not spam, but have enough similar content, they may still be regarded as spam. Since you need to know which sites might have copied your site or pages, you will need some help. We recommend using a tool that searches for copies of your page on the Internet: www.copyscape.com. Here, you can put in your web page URL to find replicas of your page on the Internet. This can help you create unique content, or even address the issue of someone “borrowing” your content without your permission. Let’s look at the issue regarding some search engines possibly not considering the source of the original content from distributed articles. Remember, some search engines, like Google, use link popularity to determine the most relevant results. Continue to build your link popularity, while using tools like www.copyscape.com to find how many other sites have the same article, and if allowed by the author, you may be able to alter the article as to make the content unique. If you use distributed articles for your content, consider how relevant the article is to your overall web page and then to the site as a whole. Sometimes, simply adding your own commentary to the articles can be enough to avoid the duplicate content filter; the Similar Page Checker could help you make your content unique. Further, the more relevant articles you can add to compliment the first article, the better. Search engines look at the entire web page and its relationship to the whole site, so as long as you aren’t exactly copying someone’s pages, you should be fine. If you have an eCommerce site, you should write original descriptions for your products. This can be hard to do if you have many products, but it really is necessary if you wish to avoid the duplicate content filter. Here’s another example why using the Similar Page Checker is a great idea. It can tell you how you can change your descriptions so as to have unique and original content for your site. This also works well for scraped content also. Many scraped content sites offer news. With the Similar Page Checker, you can easily determine where the news content is similar, and then change it to make it unique. The duplicate content filter is sometimes hard on sites that don’t intend to spam the search engines. But it is ultimately up to you to help the search engines determine that your site is as unique as possible. By using the tools in this article to eliminate as much duplicate content as you can, you’ll help keep your site original and fresh. Question on Object Mix forum: Is programming/computer science an art or a science? MSDN article by Stanley B. Lippman, circa 2006: Is programming an art? Slashdot discussion: Is programming art? Net Objectives blog post by Bob Hartman: Is programming an art or a science? Blog post by Aater Suleman: Is programming an art or a science? CodingForums.com discussion thread: Programming: An art or science? Blog post at O’Reilly’s ONLamp.com: Is programming art? Discussion thread at </dream.in.code>: Programming: A science or an art? If you think I’m going to wade into this debate, you’re crazy. The problem is that the question, as framed, doesn’t allow for a sensible answer. You want to know what programming is? It’s…a creative discipline. I know, because it tickles the same part of my brain that is tickled by other creative disciplines. When I was young, I had very serious musical ambitions. I did a fair bit of composing. You know what I liked about it? The combination of rigor and complexity. Musical composition requires mastery of a hugely complex set of rules, some inherent in nature and some established more arbitrarily through centuries of tradition. Despite the thousands of rules, composers are expected to exercise immense creativity. In fact, creativity is a sine qua non for achievement in musical composition. Architecture is much the same. Those who design buildings must first master in-depth knowledge of materials, structural relationships, and historical precedent, all of which are more or less binding upon their subsequent efforts. Yet within these bounds, they must employ their creative senses to create aesthetic affects. I think that even chess-playing is a creative discipline, at a certain level of seriousness. The would-be grand-master must internalize a complex set of more or less arbitrary rules, then deploy his pawns and pieces according to an overall strategy that can only be described as artistic. Cooking and the writing of fiction rely upon similar mixes of complex conventions and an aesthetic element based on creativity. Human brains – at least the brains of computer programmers, composers, architects, chess players, cooks, and writers – are drawn to tasks that conform to this mix of requirements. The essential elements are complexity, rigorous rules, and the opportunity for creative expression. We programmers like to think of ourselves as a unique branch of humanity, spawned mere decades ago along with the microprocessor. But that isn’t the case. Our love of complexity, rigor, and creativity makes us more, not less, human. Web recommendation: I love the blogs at SD Times and I feel honored to have a home here. If you’re looking to do some reading, you could scarcely do better than browsing the archives here – even before I joined the team a few months ago, the nuggets among these posts were pithy and frequent. But if you find that you have additional time and curiosity, then you simply must check out the blog network at Scientific American. These posts are funny, serious, timely, in-depth, provocative, and relevant. Be warned – if you dip your virtual toe into these waters, you may find yourself drawn in like Hylas among the nymphs. The Scientific American blog directory is here. J.D. says check it out.